School meals specifically refer to breakfast and lunch, which are offered by school cafeterias to students and often subsidized by the government. Childhood obesity has been measured by total weight, body weight percentages and skinfold measurements, but most frequently by body mass index (BMI) (i.e., weight in kilograms divided by height in meters squared). Others have studied health via fitness programs such as the Presidential Youth Fitness Test. Numerous reports have cited healthy school meals as a key factor in improved health, as seen via the meal reduction in fats, calories and sodium, and integration of whole grains, fruits and vegetables. For instance, Haerens et al. conducted a random sample of 15 schools over a two-year period to conclude that healthy food interventions lead to BMI score reductions, particularly in girls. Various studies have cited that access to unhealthy meals enhances obesity measures such as BMI. Others have shown how healthy school meals enhance physical activity, which is often measured by standardized physical fitness tests. Still others have cited confounding variables that may influence results, such as gender, race, socioeconomic status and a student’s home location (e.g., urban vs. suburban), as well as grade in school. 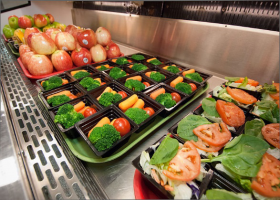 Though researchers have certainly studied healthy school meal standards, the existing literature generally falls short of specifically quantitatively assessing the HHFKA implementation and its relation to student health measures. Further investigative research is needed to better comprehend the relationship between the HHFKA, nutritional meal programs and student weight and overall health, especially in certain school districts with limited research and data resources. Do healthier school meals, as a result of the HHFKA legislation, positively impact student weight and overall health measures? Does this mandate and its details need to be updated? Or removed altogether? There are challenges to studying this issue directly, due to the difficulties in controlling student lifestyles, particularly outside of school, to accurately account for the specific impact of the HHFKA legislation. One potential approach may be to conduct a randomized study where students are sorted into two groups: a) one in which a student eats breakfast and/or lunch at school; or b) one in which a student does not eat school meals, and instead participates in competitive food programs. As students spend roughly 180 days at a school yearly, testing could begin in the fall when the academic year starts, and could be completed at the end of the school year the following spring/summer (i.e., classic experimental design with a pre-test and post-test), giving a several month long experiment window. Due to the inherent desire to control for certain variables such as gender, race, socioeconomic status, location and grade level, grade level would need to be controlled for via standardization measures (e.g., use only fourth graders in the sample). The randomization procedure of control could be employed to ensure that the two groups have similar distributions in terms of gender, race, socioeconomic status and location, all factors that may be critical in influencing the final outcomes. Researchers could investigate results using the standard Presidential Youth Fitness Test to measure changes in student’s health without applying additional strain to the students in the sample. Though students may be sensitive to testing and change behavior as a result, if testing is performed in a natural environment (i.e., their school), external validity can be maximized. Additional research is needed to better comprehend the impact of the HHFKA legislation. The program has been around long enough to now warrant a more robust and comprehensive program evaluation that can potentially inform its impact and if changes are needed. Future research may be able to demonstrate causality between HHFKA and child health outcomes such as obesity rates or physical fitness measures. Fundamental empirical research into the impacts of the HHFKA implementation is vital to understand the impacts of healthy school meal programs and if they are truly achieving their objective. Policymakers, administration and school districts of every variety should be interested in learning more about this issue. Authors: Dr. Gilbert Michaud is an Assistant Professor of Practice at the Voinovich School of Leadership and Public Affairs at Ohio University. Michaud can be reached at [email protected]. Casey Hall-Jones is a Research Scholar at the Voinovich School of Leadership and Public Affairs. Hall-Jones can be reached at [email protected].